Gyroskope now offers Dropbox integration for uploading videos, making adding files to your media manager even easier. Once logged into your Gyroskope Producer account, simply select “Choose from Dropbox” on the upload page, and choose the video file directly from your Dropbox account! Want to sell your videos, keep all of your money, and do it all from the comfort of your own website? Gyroskope’s new Premium Account is your solution. The Premium Account allows you to integrate the functionality of Gyroskope into your own website. Make your online video storefront look anyway you like by uploading your custom CSS stylesheets, and Fans will continue coming to the site they are used to visiting to access and purchase your videos. Oh, did we mention you also get your own custom apps for iOS and Android?! Your video storefront and apps will work together to bring your fans an elegant, branded, ad-free experience. 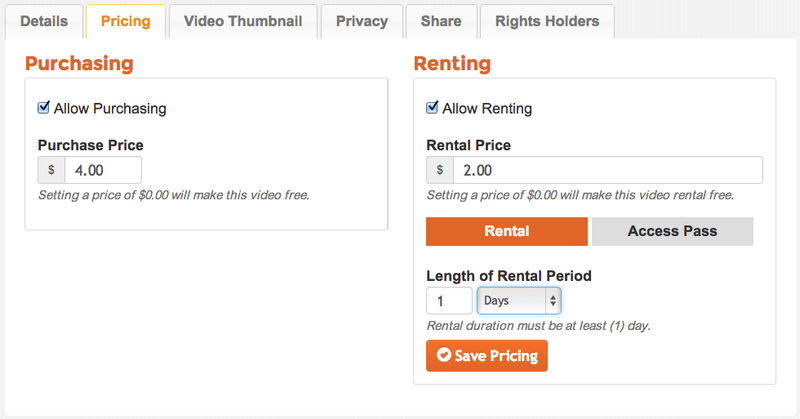 Just like Gyroskope, you can manage and share your videos from your Dashboard. 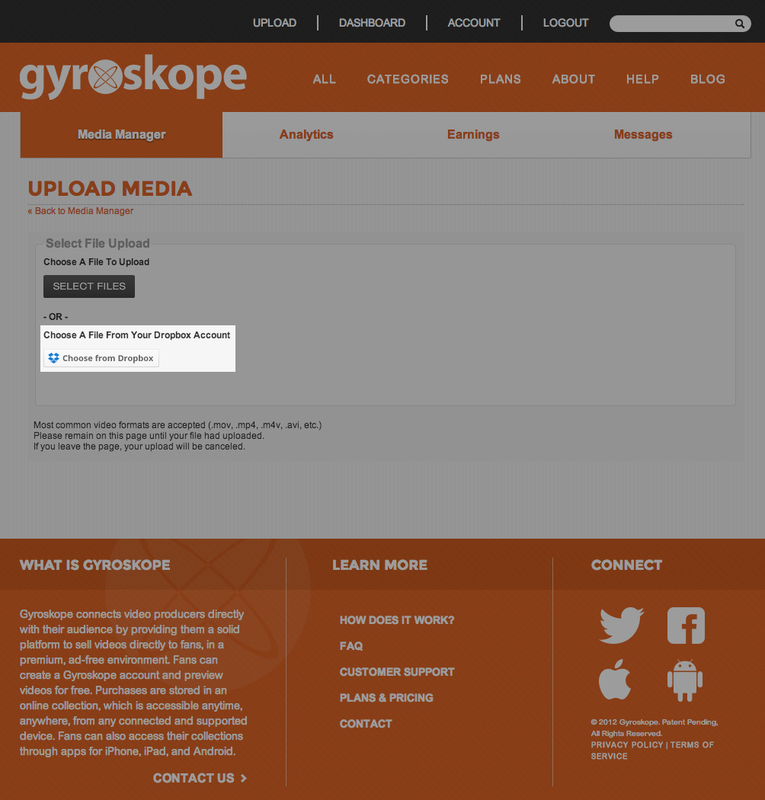 Gyroskope now offers an embeddable share player built completely using HTML5. As a Gyroskope Producer, you can share your videos on your own website, blog, etc, where fans can view the trailer for free, then follow the link back to Gyroskope.com to purchase your video. Fans who purchase your videos can also embed this player in their personal blog/website to drive people to your profile and videos. What is HTML5, and why is this important? According to Wikipedia (the mostly-factual source for all knowledge), “HTML5 is a markup language for structuring and presenting content for the World Wide Web and a core technology of the Internet. It is the fifth revision of the HTML standard (created in 1990 and standardized as HTML 4 as of 1997).” What does it all mean? Basically, HTML5 is what all the best new websites are using, and it has a lot of advantages over the older HTML4, especially in rich media (aka, videos). But why is HTML5 important to Gyroskope’s share player, specifically? That is a wonderful question and thank you very much for asking. The most important point to using HTML5 for our share player is the fact that it works cross-platform. This means that the same video will play and look marvelous on your computer as well as your parent’s slightly outdated computer, or your Android smart phone as well as your friend’s iPhone, or on your iPad tablet as well as your friend’s Kindle Fire. HTML5 is quickly becoming the new internet standard, and you will be pleased to know that Gyroskope is keeping up the pace with this embeddable Share Player! Sign Up for a free Fan Account HERE. Sign up and start sharing today! We at Gyroskope are happy to announce our new Affiliate Marketing Program feature, available to all Producers and Fans on the site. This feature allows Producers to share revenue with Affiliate Marketers (Fans) who post their videos around the internet via blogs, social media, etc. This is a win-win for Producers and Fans. Affiliate Marketing is included in all Producer Plans, as well as all free Fan accounts. I’m a Producer on Gyroskope selling my videos. How does Affiliate Marketing help me? If you are a Producer on Gyroskope.com, then you already know the power of social media and sharing on the internet. With 1.06 BILLION active users on Facebook, and another Billion active Twitter users, that’s a lot of eyeballs looking at content online, and for you? A TON of potential sales. Gyroskope’s Affiliate Marketing Program allows fans of your video creations to help you sell by posting links to your work all over the internet! You can decide what percentage to split with the Affiliate Marketers, and you only pay that percentage on the sales generated by those Affiliate Marketers. It is truly a win-win! Sign-Up and let Gyroskope’s Affiliate Marketing Program start working for you! I’m a Fan on Gyroskope. What about me? What is this all about? With your free Gyroskope Fan account, you have the unique opportunity to MAKE money by posting links to the Gyroskope videos you love. You are probably saying, “Wait, I do that anyways!” Exactly. So why not make money while posting these links to Facebook, or Twitter, or your goofy-kitten-blog (which we read, and thoroughly enjoy, btw)? To Sign-up to be a Gyroskope Affiliate Marketer: (1) Log In, (2) Click the Account button at the top of the screen, (3) Check the “I would like to join Gyroskope’s Affiliate Marketing Program” box, (4) Enter your PayPall email address, and you’re done! You will notice a new ‘Affiliate’ tab where you can check out all the Producers participating, what percentage they are offering, and the link to start sharing anywhere and everywhere you can think of! Sign-Up for your Free Fan Account and start making money today!